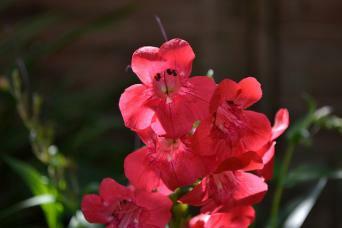 Beard tongue, also known by its botanical name penstemon, is among the top plants for use in perennial flower borders. It has an extended bloom period and excels in attracting hummingbirds. Beard tongue is named because of the fuzz that grows in the mouth-like opening of the long tubular flowers. It's not the most appealing name, but the flowers are really lovely and elegant. The two-inch blossoms come in a wider range of colors than almost any other plant and are often flecked with interesting patterns of contrasting colors. Growing anywhere from one to three feet tall and wide, depending on the variety, the plants are evergreen in mild winter climates but will sometimes die back to their roots in colder regions. Long, lanky stems grow in an upward-arching fashion from the base with the flowers appearing along the length of the stems as they grow. Beard tongue likes full sun and, other than the dwarf varieties, room to sprawl. 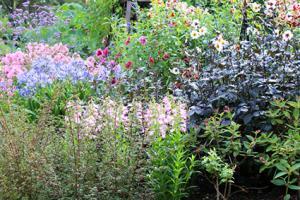 It is very adaptable to soil type, other than boggy conditions. Penstemon is a North American native species and is often found growing in somewhat dry, infertile soils - meaning that it is not the sort of plant that needs to be pampered with the best garden soil, fertilizer or constant irrigation. Plant beard tongue in fall or spring and give it a deep mulch to help conserve the moisture that is already in the ground. It will need weekly irrigation in its first year, but after that it will tolerate all but the most severe droughts. Penstemon flowers for two months or more of its own accord, but it will be helped by the removal of the spent flower stalks. Once it's done flowering in late fall, cut all the stalks back by about 50 percent to generate compact growth and abundant flowering in the following year. Beard tongue is rarely bothered by pests and diseases, but it is not a long-lived plant. If it starts looking diseased after its third or fourth year, this can be taken as a sign of natural decline and an opportunity to replace the plant. Powdery mildew and snails occasionally show up on penstemon plants, though both are a sign that it is being over watered or that the soil is poorly drained. On the whole penstemon does best in the drier climates of the West, but it is worth growing the East - it's just a bit more finicky in humid climates. Electric Blue is as vividly blue as the name suggests and grows to only 18 inches in height. Husker Red grows to about 30 inches in height with pinkish-white flowers and unusual maroon-colored leaves. 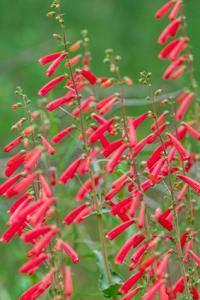 Firecracker is one of the brightest, boldest varieties, growing three feet tall with large orange-red blossoms. Raven has deep purple blossoms with a white throat and grows to about three feet. 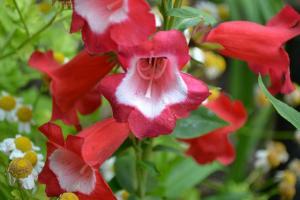 Penstemon is stunning in bloom and offers an impressive array of color choices for the perennial border. Just make sure to give it a good trim once a year to keep it looking its best.